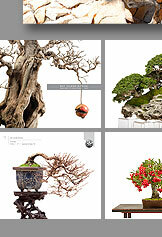 The show book contains over 100 color photographs of fine bonsai and accent plants. This beautifully designed, 10x8 inch book is available in a hard cover with a dust jacket and contains 106 richly-colored pages. You can order direct from the book publisher, blurb.com, by clicking the link below. Price: $51.95 (hard back) Click here. Blurb.com, offers a variety of shipping options.